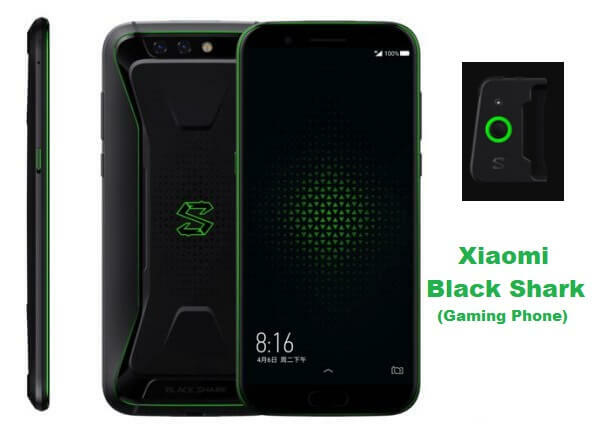 Finally Black Shark a new smartphone brand has been officially announced in China after many leaks which is the First Gaming Smartphone from Xiaomi. The smartphone is specially designed for mobile gamers. The Black Shark comes in Polar Night Black and Sky Gray color options. The device runs on Android 8.1 (Oreo) and has a 2.8GHz Octa-Core Qualcomm Snapdragon 845 processor with an Adreno 630 GPU. It comes with two storage variants i.e 6GB RAM with 64GB storage and 8GB RAM with 128GB internal storage. The 6GB/8GB RAM gives a great performance by reducing the heating temperature while playing. There is a SHARK key to play games and has a Fingerprint sensor on the front. The smartphone measures 161.6×75.4x 9.25mm and Weigh 190g. The Dual SIM (nano + nano) device has a 12MP rear camera and secondary 20MP rear camera. On the front, it has a 20MP selfie camera for video calls and selfies. The Black Shark comes with a 5.99-inch Full HD+ 18:9 display with 2160 × 1080 pixels resolution. The Black Shark smartphone is powered by a 4000mAh battery with Quick Charge 3.0. There is a Dual Smart PA, Hi-Fi Audio, and Dual Speakers. Coming to connectivity options it includes 4G VoLTE, WiFi 802.11ac, Bluetooth v5, GPS/GLONASS/Beidou, and USB Type-C.